I watched two coming-of-age-themed movies this weekend that had enough interesting compare-and-contrast elements between them that I decided I wanted to write a quick article here reviewing them. Both came out this summer (within a couple weeks of each other, if I’m not mistaken), and both deal with teenage boys becoming frustrated with their parents and retreating to secret getaways. Both have romance plots but are more about family and struggling with a lack of identity. The similarities don’t end there. Both have scenes of family breakdown revolving around board games. Both have strong connections to NBC sitcom actors — The Way Way Back was co-written by Jim Rash (Community) and co-stars Steve Carell (The Office); The Kings of Summer co-stars Nick Offerman (P&R) and Alison Brie (Community). I’m sure you could find a few more ways to draw connections between the pair of movies, but here’s the key one I want to draw: both are pretty good! I’ll start with The Way Way Back, which was the first one I saw and is my favorite among the two. Duncan and his family go on vacation with Trent’s friends, and the miserable Duncan rides a little girl’s bike around town until he stumbles upon a water park with some friendly faces. Chief among these is carefree man-child Owen (Sam Rockwell) and his girlfriend Caitlin (Maya Rudolph). Owen offers Duncan a job, leading to some of the most enjoyable scenes of the movie; an impromptu dance-off where Duncan earns the name “pop and lock,” while a bit unbelievable, put a huge smile on my face. Meanwhile, Duncan’s relationships with his mom and Trent continue to strain. Duncan also finds a kindred miserable spirit in Susanna (AnnaSophia Robb). What I loved most about The Way Way Back was the script, and the way every character gets at least a few moments of complexity and humanity. The cast is uniformly superb. Carell and Collette (Duncan’s mom) are never bad, but the show stealer is Rockwell as Owen. His deadpan dialogue, thinly masking plenty of melancholy, sounds like it was written with late-80s Bill Murray in mind, but I can’t imagine Murray would ever have played it better. A couple elements feel undercooked and worthy of a few more minutes of screen time (Duncan’s friendship with Susanna comes to mind), but never to a point that detracts from the movie. Throw in a strong soundtrack and a gut-busting appearance by Jim Rash and it adds up to my favorite teenage coming-of-age movie since Adventureland (which also takes place over a summer at a theme park). 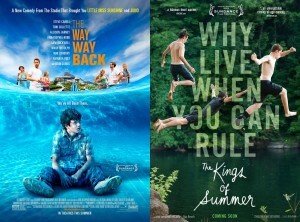 While The Way Way Back feels like a bit of an ’80s throwback, The Kings of Summer is very distinctly a millennial indie movie. The colorful visual style, meandering shots of wildlife, and occasional dream sequences give the film a very unique, off-kilter feel. Joe (Nick Robinson) and Patrick (Gabriel Basso) both are fed up with their home lives. Joe constantly fights with his abrasive father (Offerman) while Patrick’s parents are too sweet, dull, and overbearing. Joe comes up with the idea of moving to the woods with Patrick to live on their own. The strange, diminutive Biaggio (Moises Arias) tags along, and the three strike out into an empty patch of woods where they build a makeshift house from scraps. Beyond escaping and spiting his father, Joe’s goal is to prove his manliness to Kelly (Erin Moriarty), who seems more interested in rugged, muscular guys. 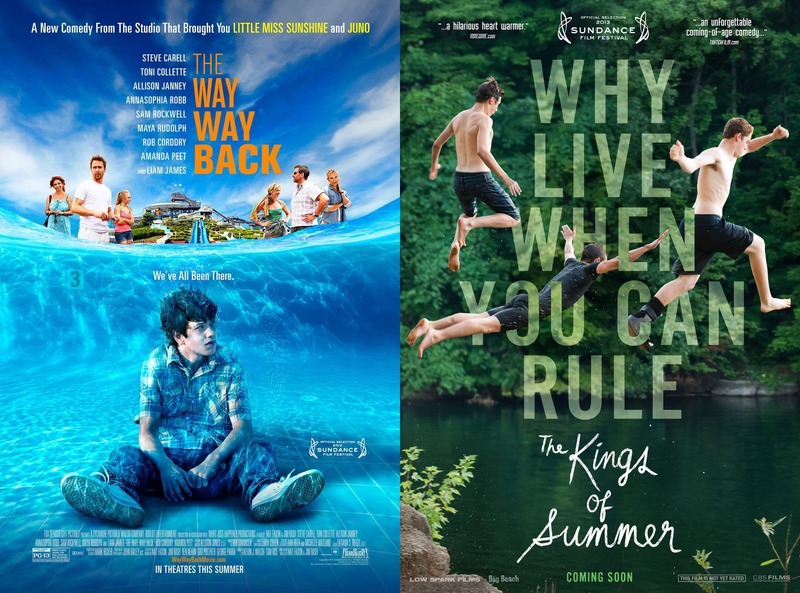 The Kings of Summer is a bit heavy on the wish fulfillment, and is much more bittersweet than The Way Way Back. The protagonist Joe is angry and sometimes alienating — to the point I was occasionally rooting against him. This movie has a handful of moments that are really inspired, though. A late montage comparing Joe and his father worked really well, and a few of the more whimsical moments of the boys enjoying the wilderness definitely had me smiling. My biggest issue with the film is that it seems a bit tonally confused. The drama and the comedy don’t mesh particularly well, and the jokes don’t always land. It also has a bit of a “trying too hard” strain to it, like it really WANTS to be an indie critical darling. Nick Robinson as Joe has a bit of James Franco to him, but the actor he really made me think of was Heath Ledger (in part because he looks similar). I wouldn’t be surprised if we look at this as his 10 Things I Hate About You — a charming coming-out party that he’s overqualified for. I’ll have my eye on Robinson. The real show-stealer is Moises Arias as Biaggio, though. He’s written as the comic relief, but Arias takes the part and runs away with it. He plays Biaggio as intensely strange in way that makes even the bad jokes work. It’s worth seeing this movie for Arias’s performance alone. In all, these are a pair of enjoyable, sweet, and thoughtful films with a coming of age theme. There are a couple more from the past year that I may review here (The Spectacular Now, etc. ), but these two were a great start.